It is essential for the student to understand important issues of a technology–based society and exhibit ethical behavior in the use of the computer and other technologies. 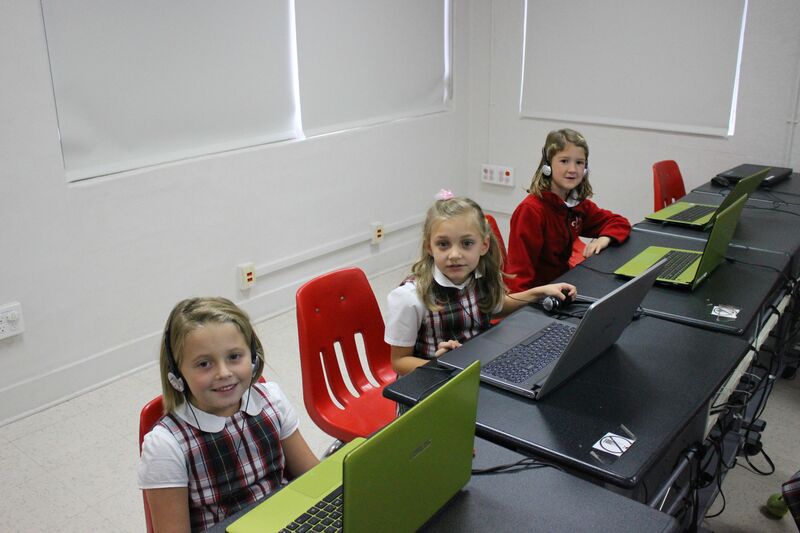 The student will be able to demonstrate knowledge and skills in the use of the computer and other technologies and use a variety of technologies to access, analyze, interpret, synthesize, apply, and communicate information. Students will also be able to identify the physical components of a computer system as either input, output, or processing devices; demonstrate proper keyboarding techniques and the proper use of special keys; use painting and drawing tools; use word processing techniques; create presentations using presentation software; create spreadsheets, insert charts; use the Internet as a research tool; and integrate between a variety of Google Drive software. There is a Yearbook club comprised of 7th and 8th graders that meets during the second semester. http://www.freetypinggame.net/ Great resource for tests, games, and lessons. I suggest starting on the lessons to help your child learn finger placement better. http://typingme.com/typing-lessons.html This is another good resource. It's a bit simpler in design but achieves the same end goal. You will have to click on the British flag in the corner since it was developed by a Turkish programmer. http://www.abcya.com/ This is another good resource for typing and educational games. We have a subscription to this one but only enough seats for school. Feel free to get a subscription for your family if you like it and you can practice ad free. Code.org - This is a preferred site as I was trained on how to use this concerning the Hour of Code that we do in December. Students can code anytime though. There is coding by blocking and by clicking on HTML, they can see what the HTML code would be that they are creating. Scratch.mit.edu - Many students got into this years ago with Mr. Ross teaching computers. While I use code.org, there are more complicated designs with music and games that could be created using this site. I encourage students with a desire for creativity in coding to check this site out. Great resource for tutorials on Office and technology in general. We watch these and students can improve their skills drastically by following these guides. We will be doing more of these as they year progresses. https://www.netsmartzkids.org/ - From the National Center for Exploited Children - we have a speaker come in to talk with students about this important topic in the spring. There are some videos that may be helpful in showing to your child on this topic. Please note that since the school adopted use of Khan Academy Mappers and Newsela to prepare students for the MAP tests, there has been a significant amount of time spent on these programs/apps to get them off the ground. The children enjoy a wonderful physical program at the CCS. The program is delivered with the South Carolina Standards for Physical Education at the forefront of their lessons. They are encouraged at all ages to become individual and team thinkers, leaders and above all value the contribution physical education brings to their lives. In Kindergarten, the children develop their social and basic motor skills through a variety of adapted games and activities. They are challenged to problem solve and to work in small teams. Activities include parachute games, tag, basketball, soccer and bean-bag challenges. The Lower School (Grades 1-4) are taken through a challenging and intensive physical education program as they continue their on-going development of motor skills. They compete in many different sports including hockey, soccer, volleyball, badminton, tennis, dodgeball and kickball. They are encouraged to take leadership roles and promote team-spirit whilst learning the rules and regulations of different sports. The Upper School (Grades 5-8) is expected to demonstrate excellent team-spirit and co-operation as they enhance their skill development through many team sports, games and activities. They learn the theoretical elements of physical education and the components of fitness. They are expected to track their own progress as they self assess and monitor their own health and fitness levels.